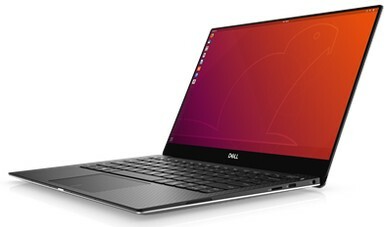 The Intel Core i7-8550U-powered Dell XPS 13 9370 ultrabook is now available with Ubuntu Linux 18.04 onboard. The first XPS 13 Developer Edition arrived more than five years ago and back then it had Ubuntu 12.04 installed. The new XPS 13 Developer Edition is only available in the US for now, but Europe and Canada will follow soon. Back in the summer of 2012, Dell and Canonical joined forces to provide Ubuntu-loaded XPS laptops to developers. This effort, known as Project Sputnik, is still up and running nowadays. The latest XPS 13 Developer Edition is the seventh generation Ubuntu-driven laptop from Dell, it runs Ubuntu 18.04 LTS, and — only for now, fortunately — can only be found in the US. The new Dell XPS 13 Developer Edition comes in quite a few configurations, each of them also providing the customer with a few attractive hardware customization options. For example, a very good deal comes at US$1,949.99, down from a regular starting price of US$2,073.99. This configuration comes with an 8th generation Intel Core i7-8550U processor, 16 GB of memory and a 512 GB PCIe SSD, a 13.3-inch 4K InfinityEdge touchscreen display, and a 52 WHr battery. If the setup above seems too expensive, those on a tight budget can even go below the US$1,000 threshold. The US$949.99 (down from US$973.99) Dell XPS 13 Developer Edition sports an Intel Core i5-8250U processor, 4 GB of memory and a 128 GB SSD, a 13.3-inch full HD display (non-touch, of course), and a 52 Whr battery. Upgrading the memory to 8 GB is something that many potential buyers will probably consider, and the US$100 required for this make it a must-have. These being said, we should also add that Europe and Canada should get the latest Dell XPS 13 Developer Edition in the coming weeks as well. There is no accurate date to talk about yet, but we are hoping Frank Azor will share this information with the world as soon as possible.